The Lockhart Basin Trail near Moab Utah is one that we've explored parts of in the past, but because of it's length and remoteness it's one that takes a bit more planning than some of the other trails around Moab. The length of the actual trail is around 40 miles one way, but depending on where you start and what spurs you take it can add many more miles to the trip. We began our journey Friday morning by turning past the Mcdonalds in Moab, traveling up Kane Creek Road to unload our bikes and rock buggy just before making the accent up and over Hurrah Pass. When all was said and done, we logged well over 140 miles over a 4 day time period. Our plan was to make a good amount of miles the first day and camp near Lockhart Canyon to set up a base camp. We would then use one day to explore Lockhart Canyon and other spurs if possible, then another day to complete the trail to the South. We ended up only logging about 26 miles the first day because of the difficulty of the first part of the trail for our 2 young boys. We found a perfect spot however just 10 miles before reaching our goal of Lockhart Canyon. This would end up adding more mileage having to backtrack further to camp, but we enjoyed the rest on the first day and the extra riding on the days following. Below is a map of our route. Click the icons for more detail and/or use the zoom control and other buttons to navigate the map. I've marked points of interest including our base camp, the caves, little bridge arch, and a couple of other really nice camp spots we found within Lockhart Canyon. The "4x4 camp" spot requires a capable vehicle because of the loose climb required to reach the spot, but it is a great location with a few good possible tent spots. Our base camp was beautiful providing full shade all afternoon and awesome scenery. It made for a really nice area to come back to after a long ride. All of our cooking was done with the dutch oven using either the charcoal and/or wood that we brought with us. We camped here for all 3 nights. On our first full day after setting up base camp we traveled South to Lockhart Canyon, then down Lockhart Canyon and into Canyonlands until we reached the Colorado River. It was a little bit of a hike through the brush to reach the river. We had some minor bike issues with Brayden's bike after a collision with Owen. Here Shelly is just finishing up after we fixed the broken throttle cable, then we continued on to the river for the short walk through the brush. On the second full day on the trail we finished the trail by heading South towards hwy 211. The Southern portion of the trail travels on a much better road and you can make more miles in a day. Indian Creek near Hamburger Rock Campground is a fun place to hang out and let the kids play a bit although it is a popular place for that reason. It felt good to wash the sand off a bit and cool down before heading back to camp for our last night. On our last evening we did a little hike near camp and found a few really cool areas. The additional water this spring really made it greener than I've seen it in a while. Monday morning we traveled back to our truck and trailer on the other side of Hurrah Pass. We ran out of gas in the bronco just before reaching Hurrah Pass. Luckily I was able to ride back to our tow rig and drive it out to tow it back without too much hassle. It was a really great trip that everyone enjoyed. This is definitely a quieter side of Moab. If your looking for a remote and scenic location where you'll be hard pressed to see any other people, this is a great trail to try. The trail could be completed in a day by driving back the pavement, but a multi-day trip makes it more enjoyable and it was necessary for us with our young riders. It could be done quite quickly by an experienced dirt bike rider however. Plan on a very full day in a jeep if it's done in one day. Below is a slide show summary of the trail mostly taken from my helmet cam along the way. It's hard to capture the beauty and remoteness of this place, but this gives a little taste of it and it's worth checking out. The trail is rated a 3+ on the red rock rating scale. It's fairly easy on a bike, but some obstacles will require a capable 4x4 for the 4 wheel types. Our boys, had their hands more than full in a couple places, but by the end had all but mastered the rocks. Looks like an awesome trip. Good scenery and a lot of riding. I like your camping spot! I wish I can go to Moab sometime, I want to do the Sovereign Trail, not much like the stuff you ride on but it should be a good mountain bike trail just to go for a few hours or so. I've actually ridden a lot of the sovereign trail on my dirt bike..on the same trip we went to mesa verde. So, is it a good trail? I found it on a website and I did learn some of the trails is motocross and some of it is mountain bike trail. 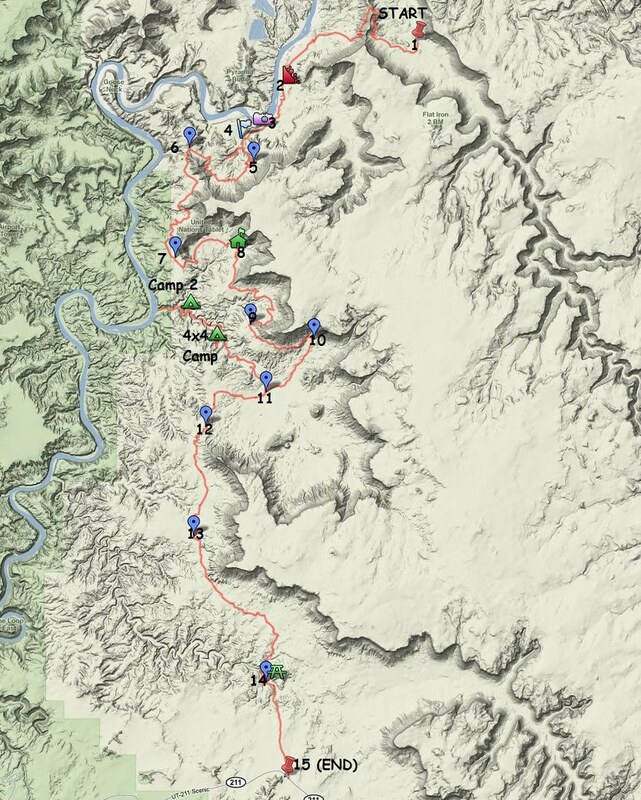 I heard about the trail from a friend that runs the bike shop in Manti and grew up in Moab. He told me I should try that trail. I want to do the out and back one for like 13 miles or something like that. I saw the video of it too and it looks technical. Sweet! I like the slide show! Thanks, yea I thought it seemed like a good trail, I had a lot of fun on it. I wish I could have captured more of the technical stuff on lockhart on film, it's hard when managing 3 bikes through the tough spots to take pictures. These were taken at random through some sections, more for scenic value and an overall sense of the trail. ..Lockhart is not a difficult trail, just long and remote..some of the technical stuff was fun though, and it really pushed the kids at times. I really like your informative blog. What a blast!! Awesome scenery, remote, and very few people are my kind of trip! Came across this post after a google search. I just rode this route yesterday. Pritchett Canyon parking lot to the Needles Outpost store and back. 120 miles. Basically 2 hours down and 2 hours back. Didn't see a single soul the whole ride! I really enjoyed it. Funny, the junk camo trailer was on it's side and stuffed up into the cliff when I went by. Cool!, I need to get back to that area soon. That trailer was actually pushed over while we were down there! One day it was like you see it here, the next day it was pushed up against the cliff. We heard a group of jeeps pass our camp that night, I'm assuming they got drunk and decided it would be fun to push it up there.